I have to be honest. I meant to get to this last week, but then I got so excited about getting our new chicks that I didn’t take the time to get this post written! Our new baby chickens have arrived and all are doing great. This piece will guide you on the steps that we took preparing for baby chicks and some of the tricks we’ve learned. 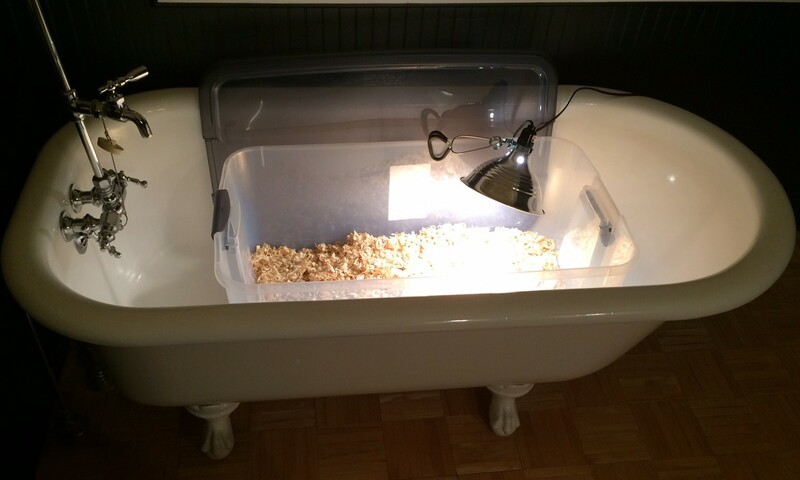 Our goal was to create a brooder in our house for our young chicks. Brooder is the technical term for a device or structure for the rearing of young chickens or other birds. The most important factor is keeping the young chicks warm and safe. 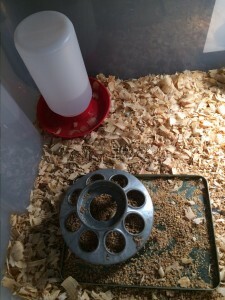 It is recommended that newly hatched chicks are kept at 95 degrees and then the temperature can be decreased by 5 degrees every week thereafter. Our set up for this is fairly simple, and as you can see, is in the bathtub in our second bathroom. The container is just a large plastic storage tub and the exact size isn’t a magic number, but simply would fit inside the dimensions of our bathtub. The light/heat source is a 110 watt bulb that is mounted with a clamp on light. Since the temperature in our house is fairly moderate we don’t need to use a heat lamp but will get enough warmth from the regular light bulb. Once this was attached to the side of the container I placed two thermometers under the bulb and adjusted until it was close to 95 degrees below. Preparing for baby chicks is much easier to do prior to bringing them home than when they are in the box peeping at you! 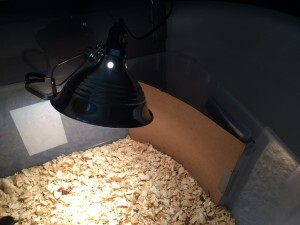 One thing we’ve learned is that the chicks will tell you when they are cold or if the bulb is too close and they are hot. If you see the chicks huddled directly under the light they are trying to get every bit of warmth possible and it is probably a good idea to lower your heat source to provide more warmth. 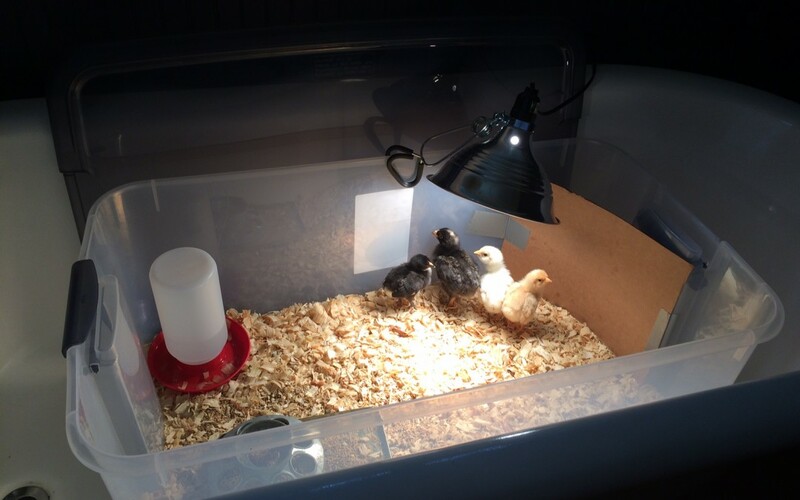 On the other hand, if you see the chicks moving away from the bulb and laying off to the side that means it is too hot directly under the lamp. Your container should be large enough to allow them the space to find the middle ground for the perfect temperature. You can see here that I used a piece of cardboard to round out the corner near the lamp. 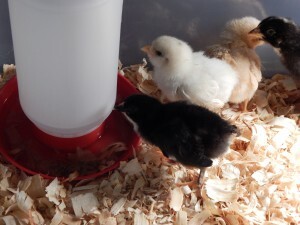 This keep the chicks from getting “stuck” in the corner under the lamp–yes, they should be able to move out of a corner, but they aren’t as smart as they are cute. After a week or so this can be removed but it is a very simple way to help assure they don’t pile up in the corner under the light. For the water we are using just a simple quart jar screw on base that we keep plenty of water available. As the chicks are placed in the container for the first time we make sure to dip each chicks beak in the water to make sure that they know where it is at. I’ve been told that you really only need to see one chick drink and the others will follow, but with only four chicks it doesn’t take very long to have everyone dipped and ready to go. 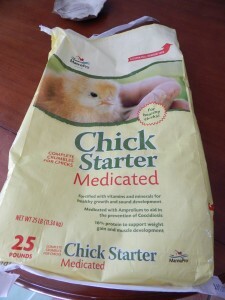 You can put the chick feed in just about anything. I recycled a holiday cookie tin as a good place to get the food started and as they start to eat more I will use the quart feeder that goes on the mason jar. 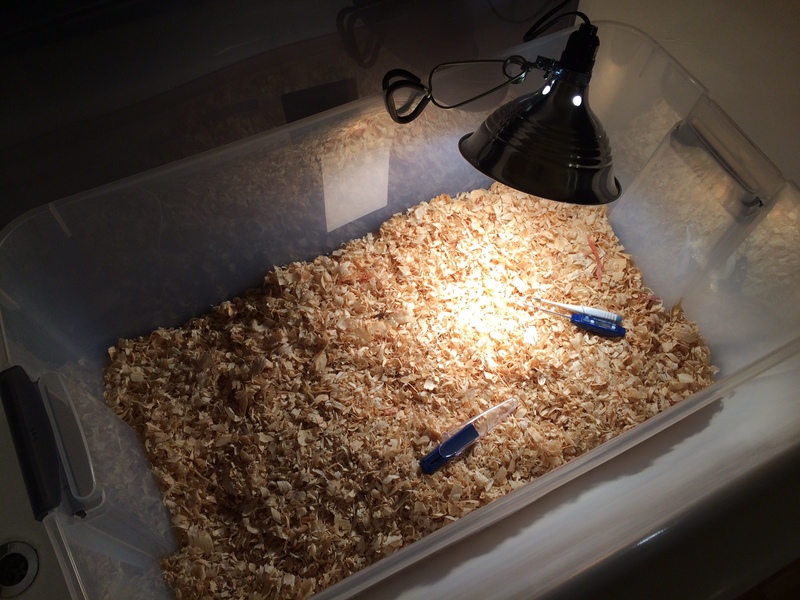 The set -up for your home chick brooder doesn’t have to be complicated but it pays to do it right and spend a few minutes getting everything ready before your eggs hatch or you bring your new chicks home. You can see in the below photo that our chicks are taking off and doing very well! And yes, they are still in the bathtub.